Cartoon characters have become Japan’s most important cultural export, and I’ve heard that the total sales abroad of anime, manga and their related merchandise have grown to surpass even those of the automobile industry. Anpanman, Doraemon, Ultraman, Pikachu and their friends have become hugely popular, even household names, not only in Japan, but in many countries around the globe, as Japanese artists continue to prove that this Land of the Cult of the KAWAII (cute), is THE major comicbook and cartoon character powerhouse in the world. In addition, nearly every major event, sports team, train line etc, has its own mascot character. If you ever visited a temple or shrine during the first few days of the new year in Japan, you will have surely seen stalls set up for selling what are probably Japan’s longest continuously (and probably best) selling CHARACTERs of all time – the (usually) red-robed, bearded, arm-less, legless and eyeless, Humpty-Dumpty-like dolls, offered in various sizes and prices (usually for 500 to 10,000 yen): the Daruma-San. Though these iconic, paper-mache figures are not specifically O-Shogatsu (New Year’s) decorations, they are considered to be highly auspicious (engi-mono), and are often bought on appropriately auspicious days. They are used in this way: If you have anything important you’d like to wish for, or even better, if there is something that you are really willing to make an all-out effort for, you buy one, paint in the right eye and then set it in your home (company, office etc.). If your wish comes true, you paint in the other eye! It is common to see scenes of this being done by politicians who have just won an election or by the manager of the baseball team that has just gone all the way. What symbolic connection do these figures have to the power of achieving one’s wishes? Well, the Daruma dolls are a standardized caricature, which took on its basic current form in the Edo Period (1600-1868), of the great 5th century AD monk, and supposed founder of Zen Buddhism, Bodhidharma. The story of this South-Indian (who according to ancient Chinese sources had bright blue eyes!) 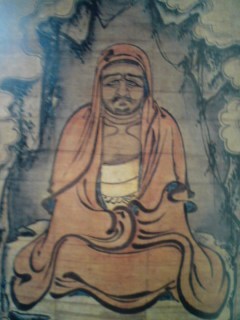 who is also said to have brought TEA and new, powerful forms of martial arts training to China, first reached Japan in the Kamakura Period (along with Zen itself), and many Japanese artists, under the influence of that Buddhist sect, which the samurai found so appealing, drew many images of him. These, of course were all based on Chinese reports of Bodhidharma having been a big, large-nosed, and very hairy barbarian. The most impressive point for the Japanese who heard the legends of bodhidharma, was the man’s (and his disciple Eka’s) super-human determination. To be specific, after having travelled to China, the monk settled in a cave near the Shaolin Temple, and proceeded to meditate, with the hope of achieving SATORI (enlightenment), for the next nine years! When Eka (Hui K’o, in Chinese, Dazu Huike in English), was refused repeatedly to be allowed to become the master’s disciple, he finally resorted to cutting off his arm and presenting it as a powerful petition which could not be refused! (Years ago in Southern Nepal, my friends and I crossed over to an island at a spot where three rivers met to meet with a holy-man who had been cutting off bits of his arm every year!) It is not strange that the Japanese warrior class found these stories to be inspirational, especially given the additional stories of BODIDARUMA having been a great martial arts teacher. 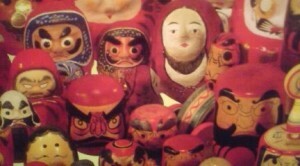 Today’s Daruma Dolls are a detailed reflection of these early Bodhidarma legends, and we can find the roots of today’s dolls in medieval Japanese paintings. The reason that the dolls are red is that red was the color of the robes worn by the Zen monks of the highest spiritual attainment. We can see the red robes in some of the earliest Japanese depictions of DARUMA, for example, the 14th century Daruma-Zu, by Minchoh (明兆). 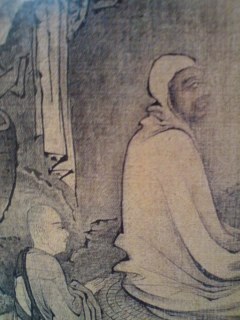 Even in the paintings, the monk’s arms and legs were never clearly shown, as his body is usually portrayed in a seated zazen position. The Edo Period creator of the Daruma doll did away with arms and legs altogether. This represented the loss of these limbs due to lack of use for the nine years of meditation. This might have also made them like toy punching bags that always pop back up on their feet, symbolizing die-hard determination (and who, if not the Japanese, as a nation, are good at getting back up after being knocked down?). 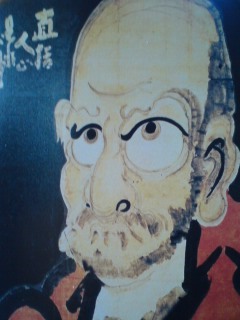 Of course, the beard and mustache are in accordance with the story of Bodhidharma being a hairy, non-Chinese. More interesting, however, is the matter of the eyes. As I said earlier, Chinese sources stated that the monk’s eyes were blue. 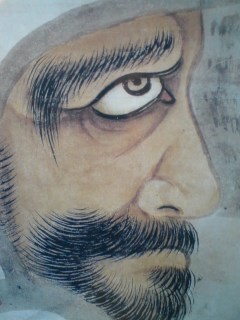 In early Japanese Zen painting this was usually executed by making the irises light brown. The creator of the present doll form, however, did away with the eyes completely, creating only disproportionately large white circles (COULD THIS BE THE ROOT OF THE STRANGELY ENLARGED EYES OF ALL MANGA AND ANIME CHARACTERS?). This also is in accordance with Bodhidharma’s legend, in which he supposedly nodded off for a bit sometime into his seventh year of meditation. Disgusted with himself, and determined not to do so again, the man with the will of steel ripped off his own eye-lids. It is said that tea bushes first sprang from the spot where the bloody lids landed. The tea would help future monks stay awake during their own meditations. The Japanese were obviously deeply impressed by the story of Bodhidharma, and came to associate him with a fierce determination to accomplish one’s goals. He was also revered as a martial artist and as the man who was said to have brought forth what would come to be a great elixir in Japan, green tea. Daruma-San was clearly someone to be appealed to when you made up your mind that you REALLY WANTED SOMETHING. Since the Daruma dolls as we know them today were created and popularized, the meanings behind the doll’s features have been forgotten by most. 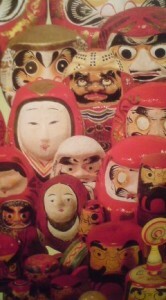 Still these dolls remain one of the most recognizable, and beloved CHARACTERS in Japanese culture. At shrines and temples this week you will see them on sale at stalls. Nearby you will see booths selling the DARUMA’s descendants, Anpanman and Ultra-man (amongst others), in blow-up doll or mask form. 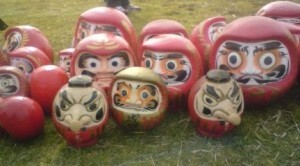 A diversity of Daruma Dolls! And a good way to get your DARUMA DOLL any year is to head out to Joso City (常総市), formerly called Mitsukaido, for the Anraku Ji Temples (安楽寺) annual Daruma Market. 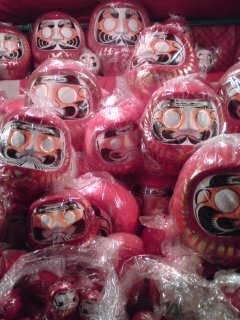 Besides all the stalls selling festival foods a Daruma Doll`s etc. At about 2:30 pm a ritual fire ( GOMA TAKI) is lit for purification rites. This ceremony has been held at this temple since the Edo Period. 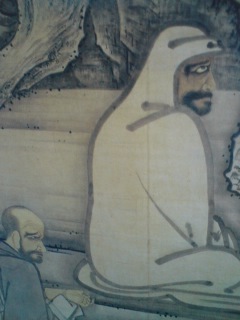 At that time it was carried out with the intention of protecting Edo Castle from the unlucky direction (KIMON,鬼門). An interesting aspect of this temple is that there are four gates through which you can enter, and you cn select the gate you walk through to be in accordance with what you want to pray for. The East Gate is for Good Luck, the South Gate for Health and Longevity, the West Gate for Easy Delivery and the Central Gate for Unlucky Age Purification ( YAKU YOKE, 厄除け). This temple is also called GANSAN-DAISHI (元三大師), which is the posthumous name of Ryogen( 良源) the great Heian Period Abbot of the Enryaku-Ji Temple in Kyoto. The Daruma Ichi and Goma taki ceremony are held on January 3rd because the 3rd day of the 1st month is Ryogen`s Memorial Day ( En nichi). There are nice woods in front of this temple which are sometimes used as locations for historical TV dramas. You could catch many aspects of Holy Daruma by Avi-san’s nice article. There are few games that can be played with Darumas like　The Slip Daruma’s Body game: Daruma-Otoshi:ダルマ落とし」, 「 The et’s stare-out like Daruma game with a song that goes “Daruma-san Daruma-san Niramekko shimasyo!”:ダルマさん、ダルマさん、にらめっこしましょ！」, A game in which you run while calling “Fall down Daruma-san” then stop immediately by finishing the call:ダルマさんが転んだ！and after that no movement is not allowed, then call again, and again. Please ask your Japanese friends for farther explanation!! As a matter of fact I have been losing Staring-out games with my dearest spouse since we were only just lovers. I suppose this awesome fact makes our marriage life rather battle-scarce, with plenty of laughter in around 40years,thanks Holy Daruma!! Then here is a Display of how to make Daruma dolls which are made of chips,・・・・・. I guessed but didn’t know.